The morning of April 24th, A. J. Wanderlust departs Shilshole Bay Marina to a south breeze averaging 7 knots. Departing at 10:39 am, I am thrilled when by 11:03 am A. J. Wanderlust is proceeding along under sail. 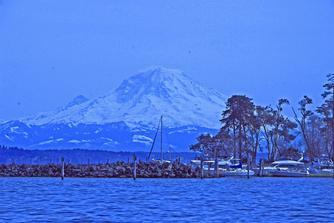 I have to come to realize that ideal sailing conditions in Puget Sound are to be treasured. The winds can be fluky and light or strong, prevailing from either the north or south with wind strengths being either very light or in excess of 20 knots. Skies this morning are overcast but clearing as bright sun rays breach the clouds. A. J. Wanderlust achieves speeds of 3.8 to 4.9 knots. It is slow progress with wind on the nose, but our sail is pleasant on this cool spring day. Denny and I tack A. J. Wanderlust to and fro to make the eight nautical miles to Blake Island. The wind dies off Blakely Rock at 3 pm blocked by the hilly terrain of Bainbridge Island. We start the engine to motor the short remaining distance to Blake Island. For ease of access for Jackson and to obtain electric heat, we dock A. J. Wanderlust rather than spending the evening on a mooring ball. Blake Island is a Washington State Marine Park, located a mere 8 nautical miles from downtown Seattle. Due to its convenient location, Blake Island is a perfect weekend escape for the nature lover. While short in distance from the city, Blake Island�s solitude in a universe away. The state park features a dock for pleasure boaters and several mooring balls are situated around the island. Near to the dock, the reconstruction of a native clan house provides a place for dinner and entertainment, featuring clan dancers, local arts and crafts, and a salmon buffet in the summer. But the highlight of Blake Island for me is the hiking. The most popular trail is the Round Island trail, roughly 3 miles long, that circles the exterior of Blake Island. Various offshoots from the Round Island trail take the hiker to grey sand beaches scattered with driftwood. Campsites surround the island, each with a small barbeque pit. Some but not all have water. 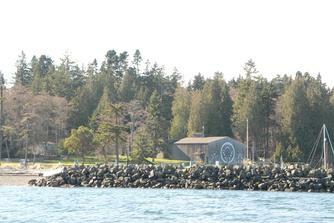 Blake Island�s natural residents include many deer, a multitude of geese and several bald eagles. In addition to the wide Round Island trail, there are also the more intimate Blue trail, Red trail and Cross Island trail. The Cross Island trail allows a unique perspective to the interior of the island. Muddy in places after a rain storm, the trail through the interior is dominated by towering ancient trees and many types of wet moss at ground level. Fallen and decaying roots provide a haven for secondary growth. The most rugged and narrow hike can be found in the Blue trail, which weaves to and fro, passing over Blake Island�s highest point, along a twisted pathway. The Red trail has characteristics of each of the other trails. Infrequently scattered about the island are benches, but an old fallen log makes the best perch. No matter the direction of the wind, a comfortable side of the island can be found for hanging on a mooring ball. Anchoring is possible, but the holding ground is sketchy and does not provide this captain with a peaceful night�s sleep. The afternoon of April 24th and morning and afternoon of April 25th are filled with long leisurely hikes. Jackson, Denny and I walk the round island trail, stopping at the sandy west end beach for a small picnic. The overlook to the south is peaceful and shaded; a happy break as we near the end of the well groomed round island trail. Denny feels ill the morning of April 25th and so Jackson and I depart to hike a combination of the cross island, blue and red trails. These trails feel more rugged and pristine; I enjoy wandering the narrow passageways under a lush green canopy. Doggie and I end our walk on the southeast side of the island which is comprised of a grey sand beach with abundant driftwood of various shapes and sizes. Jackson rolls about in the sand. I laugh and give no thought to the cleaning that will be required aboard A. J. Wanderlust once he shakes all the sand from his fur. Unable to linger any longer, A. J. Wanderlust departs Blake Island at 4:15 pm. Jackson is tired and happy from his two long walks on Blake Island. Denny�s stomach remains upset due to an unknown source. Still, he helps me get the spinnaker up before going to lie down. 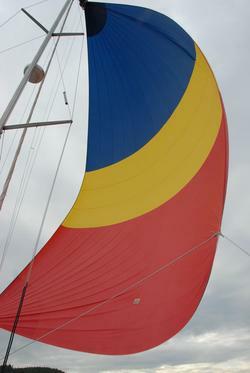 The spinnaker forms a sea of red, blue and yellow in the sky. Sadly, it is a short lived spinnaker run. In less than 30 minutes, the breeze dies and there is not even enough wind to fill the spinnaker. A. J. Wanderlust motors home across glassy seas. The night air grows cold as we arrive back to Shilshole at 7:10 pm. Blake Island�s many tall trees form the backdrop for the native style longhouse located just inside the harbor�s stone breakwater. A. J. Wanderlust�s spinnaker forms a sea of yellow, blue and red in the sky. 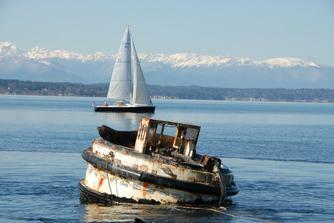 The Cascade Mountain range can be seen in the background with a sailboat and sea lions resting on a commercial mooring buoy in the foreground.